K-WAVE: Mamta Gurung, 23, (centre) with her friends at Darbar Marg on Tuesday. The three friends are avid fans of Korean drama and follow Korean fashion. Tight jeans and flat sneakers matched with outsized crop tops and a small sling bag. This is the new female fashion trend increasingly spottable on Darbar Marg, Thamel, Jhamsikhel and even Pokhara and Dharan. The young women wearing them also keep their natural skin tone, have minimal eye makeup with mascara, and are almost indistinguishable from the Korean actresses they are trying to imitate. “It’s great that I can style myself, the clothes are comfortable and stylish,” says newly-married Mamta Gurung, 23, in front of Sherpa Mall in Darbar Marg. The references for her fashion coordination were South Korean TV serials. Boys Over Flowers (2009), The Heirs (2013) and Descendants of the Sun (2016) are the most popular hit Korean tv dramas amongst young Nepalis. And actor Lee Min-ho is the most famous name from South Korean showbiz, in Nepal as elsewhere across China and Southeast Asia. 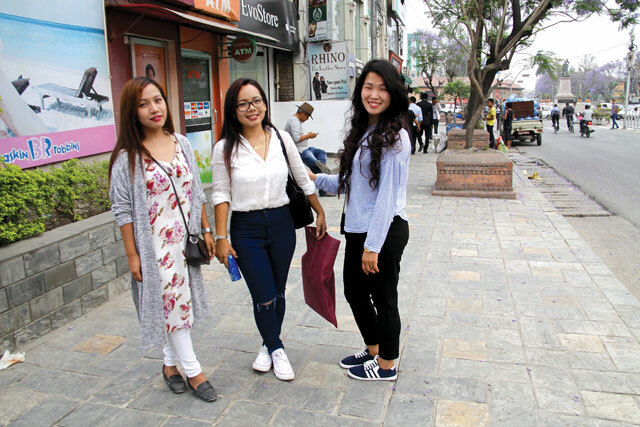 “There are lots of cute boys, the serials are not too long and there are really stylish fashion and make-ups for us to follow,” says Ria Tamang, 16, who just finished her SLC exams. Interestingly, random interviews in Kathmandu Valley revealed that it was usually Nepalis of Janajati origin like Tamang, Gurung, Sherpa or Newar mostly who were into Korean fashion and cosmetic products. In fact, many of the young women could easily be mistaken for being Korean. Most of them said they watched DVDs of Korean serials, or tuned into Korea’s KBS World channel. Even men seem to be buffeted by the Korean Wave. Two block cut hairdo and short sleeve T-shirts with flat slip-on shoes is the easiest way to spot Korean influence on men on Kathmandu’s streets. “I didn’t intentionally copy it from Korean drama, but I found it cool and stylish,” says Tsewang Tamang from Baudha in his two-block cut hair. The Korean fashion wave is not confined to the capital. Prabin Rai, 17, from Solokhumbu copies South Korean boy band style and is learning Korean language. His favourite Korean tv serial is City Hunter (2011) that had Lee Min-ho in a starring role. Rai says most of his neighbours back in the village are up-to-date with latest Korean fashion trends because they watch tv serials on YouTube. Although English or Nepali subtitles are seldom available on streamed video, it doesn’t seem to matter to them. Santa Maya BK in Grade 12 and Nisha Pariyar in Grade 6 from Lamjung district were introduced to Korean pop music and drama from Korean volunteers. Even though they live in a small town 140km from Kathmandu, they wear outfits that are identical to the teenagers on Seoul's high streets: tight jeans, short top with extra large t-shirt and a little sling bag. With recent exposure to Korean soap opera on tv and the Internet, Nepali women have started seeking out Korean clothing and cosmetic products. One such outlet in Kumaripati is called, simply, ‘Korean Shop’. And although it displays clothing from China or Thailand, customers come here mainly for men and women’s semi-leather boots and Korean fashion and cosmetics. “These are all made in Korea,” says Jeeban Raj Shrestha, 30, in Nepali-accented Korean, pointing to men’s boxer underwear, shoes, sun glasses, and other fashion accessories. Shrestha and his elder brother used to work in Korea and decided to open two shops upon their return four years ago. He admits that most of the customers come to shop because of its sign name ‘Korean Shop’. But the displayed female clothes in second floor have tags with incorrect Korean. True to its name, the most popular items here and in another Korean shop in Kumaripati, Misumi, are Made in Korea cosmetic products for skin, nail and hair care. 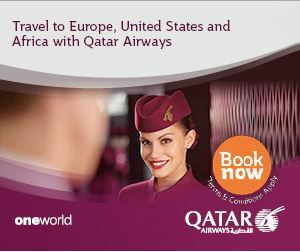 “There are about 15-20 customers visiting our shop every day. 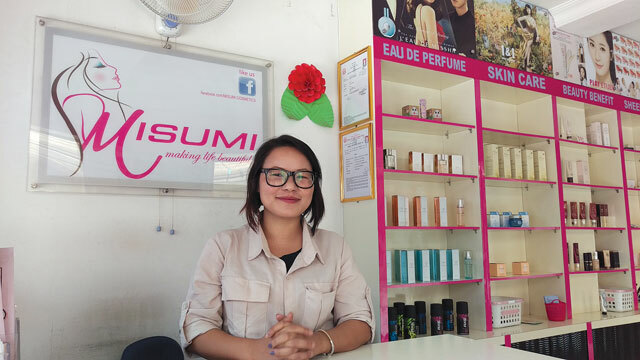 All of them know that we sell Korea’s branded cosmetic products like Missha, The Face Shop and Etude House directly from Korea,” says Misumi salesperson, Sujata Magar (pic, above). The shop was opened two years ago by Tripti Thapa and is preparing for second branch in Nag Pokhari next month, and interestingly does a lot of its marketing through Instagram and Facebook. As the customers’ needs are specifically targeted to Korean brand cosmetics, the shop is confident about its growth. The top three best sellers of Misumi are ‘BB cream’, Sheet mask pack with anti-wrinkle effect, and 3-in-one type powder ‘magic cushion’. 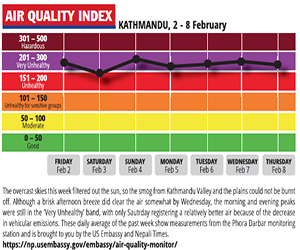 A 50ml BB cream tube from Missha costs Rs 2,005 in Kathmandu – three times more than in Korea. It is easy to spot the brightly coloured Korean Beauty Shop and Training Centre amidst a row of less decorated houses and restaurants along Bhaisepati in Lalitpur. Opened less than two months ago, the Korean salon is already a hit amongst the Valley’s K-pop fans. “Most of our customers come here because they want to look like the Korean stars they idolise,” says owner Pinky Sherpa, 22, who herself follows Korean tele-drama religiously. Sherpa says she saw a market for a Korean hair salon because of the Hallyu effect on the youth here, and a growing number of Korean expats living in the city. For the venture Sherpa has teamed with a Korean couple based in Kathmandu. Sherpa’s business partner Kwon Kyung Sun runs a Korean language institute in Bhaisepati while his wife, Kim Song Ae, offers haircutting services to customers at the salon. “Many girls come here demanding to get their hair cut like the Korean actress Kim Hye-soo while the boys ask for the two block cuts,” says Song Ae who worked as a hair stylist in Korea. Song Ae travels to Korea twice a year to buy all necessary supplies for the salon, which exclusively uses Korean products. On weekdays the salon receives around five customers, says Sherpa, and the number doubles during the weekends. "Tax evasion is a part of Nepali culture"